Not everyone gets as geeked out about overshoes/shoe covers as I do. It’s a pretty utilitarian product that’s usually purchased out of necessity rather than emotion. So that makes it an annoying necessity. But as usual, I find romance in nearly everything bike related. How do I find romance in shoe covers one may ask? Well, consider that shoe covers are typically worn during long, arduous, sunless, frigid training rides as you build base miles for the upcoming season. It’s during these thankless escapades that your true devotion to the sport shines through. It’s where a simple hobby morphs into lifestyle. It’s where you sacrifice your time and energy, but never consider it a sacrifice. How’s that for romance? One of the main reasons I purchase the Rapha brand are the aesthetics. 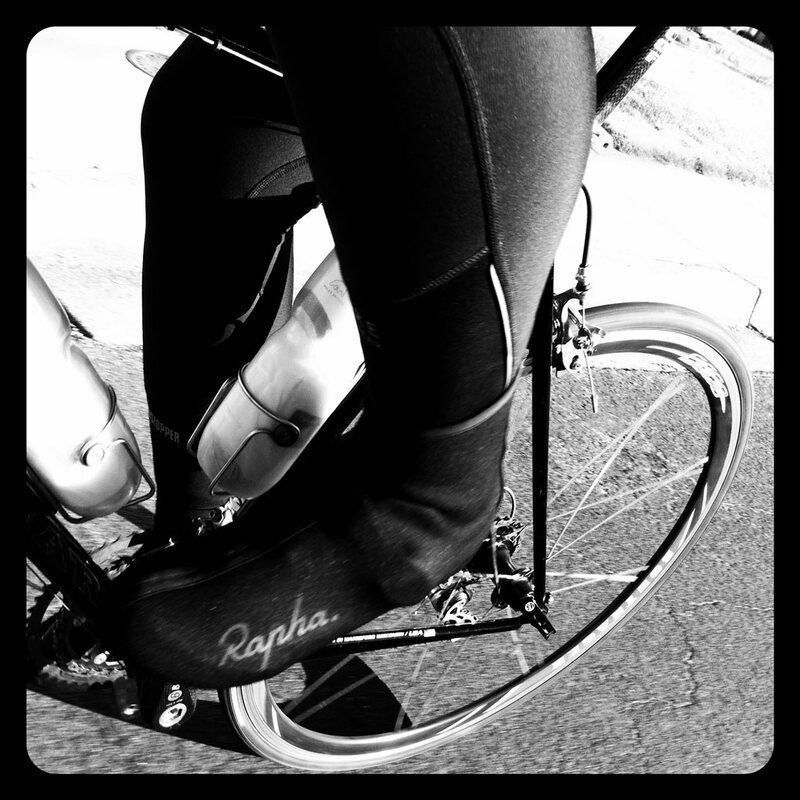 The Rapha Overshoes ($75USD) are very understated. One long strip runs the length from the toe to the top. Nothing extra adorns the sides save the tastefully added, and reflective, Rapha script logo. The rear maintains a refined look while still having a beefily designed zipper reinforcement. This area has always been the fail-point for overshoes. Covers technically need to fit extra-tight around the shoe, leaving little play for easy zipping. This makes you to zip the backend of the cover together with force. If the zipper is weak, it obviously might break. 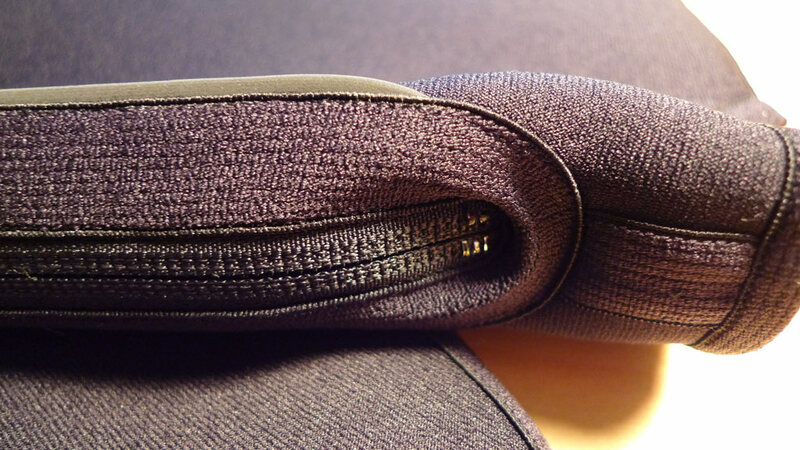 If the zipper is fine, the stress is diverted to the attaching stitching. If this is the “The rear maintains a refined look while still having a beefily designed zipper reinforcement .”weak point, then the cover falls apart from repeated usage. 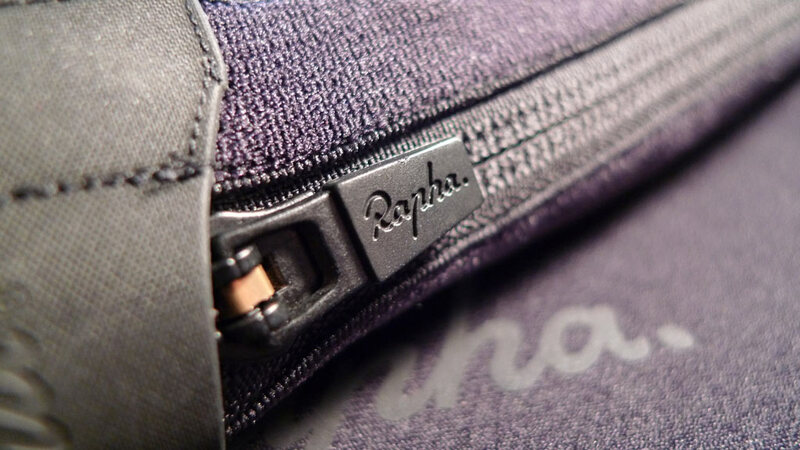 In Rapha’s case, they’ve attached the zipper with a broad area of reinforcement and two spaced stitches. I imagine that this dissemnates the stress over a broad area so that no one point is receiving 100% of the pull. All I know is that it’s super easy to zip them up, and they stay zipped. The reinforced area looks great, and as a great safety measure, they’ve sewn in a reflective stripe from top to bottom. However, while the existing stripe is perfectly placed on the outside edge for maximum visibility, an extra would go a long way in increasing visibility. Speaking of the reinforced areas, the cleat cutout along the soles are also extremely tough. Getting these things over your cleats is a herculean task. On my first try I swore I was going to tear right through the fabric, but no. They’ve held up to multiple installs, and each time it gets easier. Trick is figuring out a technique that works for you, then repeating. Element-handling duties are performed by neoprene. 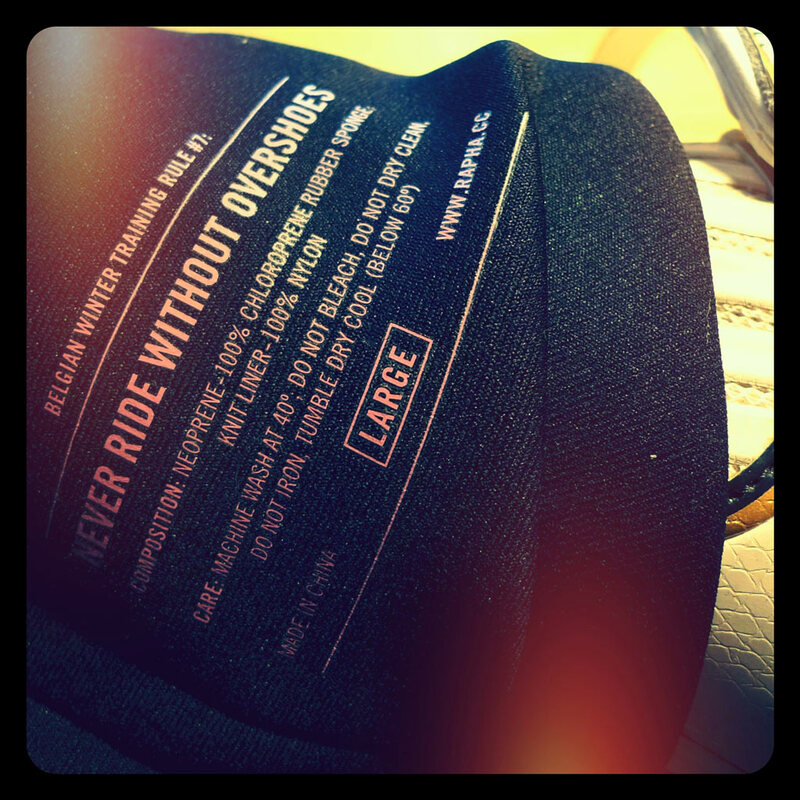 I fact-checked the deets re: neoprene as I was writing this post which only served to confuse me. It’s my understanding that neoprene allows some moisture through but in turn uses it to aid with insulation. It’s the same material as wetsuits, and again, it’s my understanding that you get wet in a wetsuit, hence the name. As I was searching on the net, I kept reading that neoprene was waterproof. Whatever. You will notice that your shoes and socks will be damp after taking them off. But it’s more like a warm blanket that you never noticed was wet. Whether that was from the outside water, or my own steeping juices I couldn’t tell you. I’ve ridden these covers in temps ranging from 25˚F to 55˚F and they didn’t blink. Wear wool socks for the lower temps and you’ll be well insulated from anything the weather throws at you. Your temperature tolerance may vary from mine, so your bottom temp may be lower than mine. But it’s safe to say that it handles a broad range of standard, adverse-condition, training weather temps. 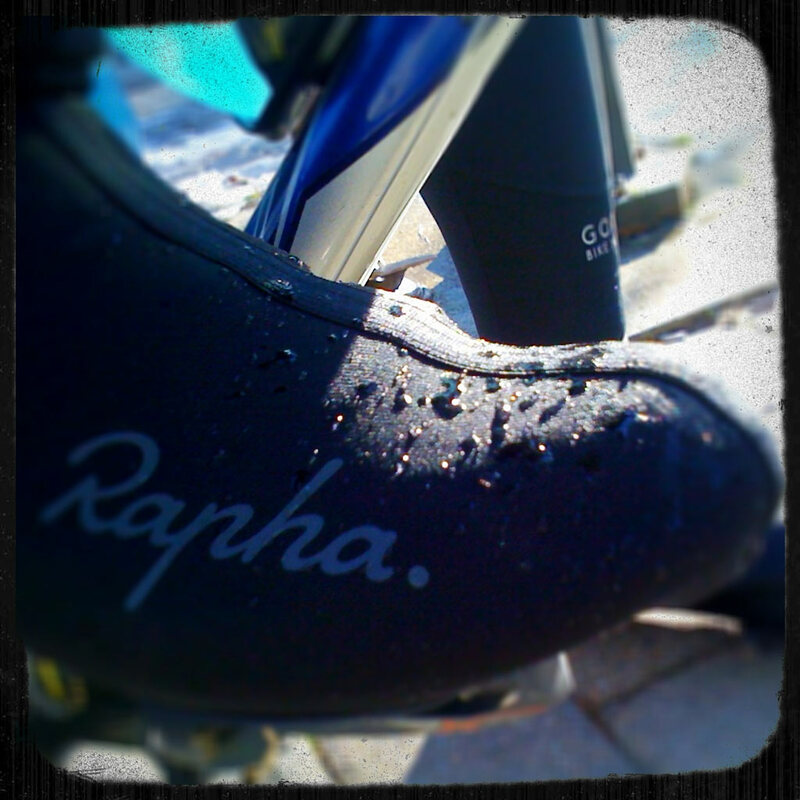 During my coldest test ride, I tried saturating the covers with water from a public pump. I never felt a temperature change. I love these things. 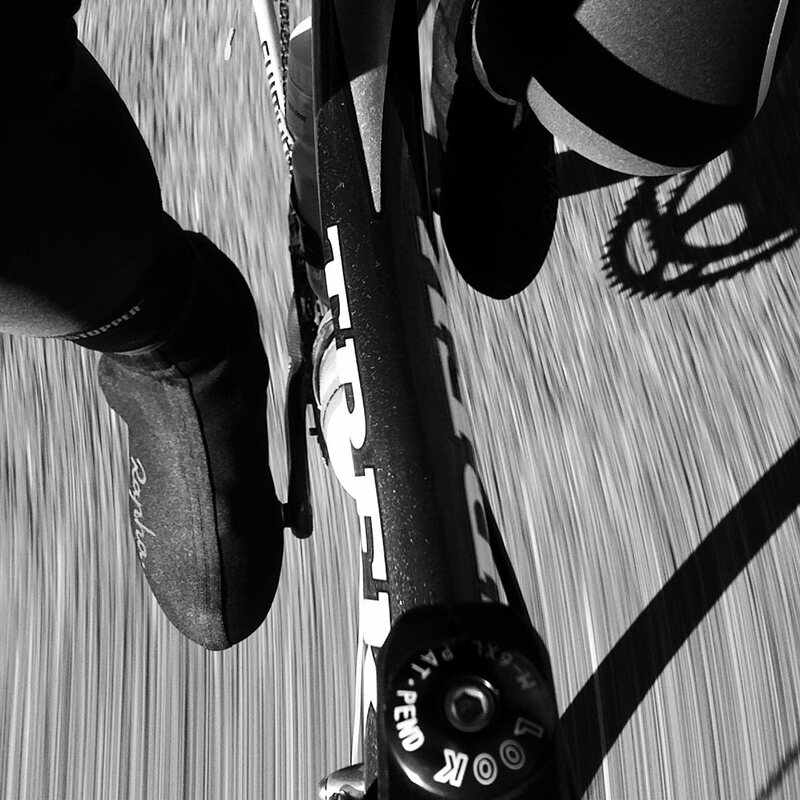 The overshoes nearly got through this review unscathed. But this AM’s ride showed me that the velcro for one of the ankle closures has started to come apart. Not something I’d expect from the quality I’ve come to expect from Rapha, but *ish happens. I’m going to contact them regarding the issue, and update this post with my progress. They do the job, and they do it well. Like I said above, not everyone gets as hyped as I do for overshoes, but these kill it. A combination of understated but bold style and strength in areas where needed make a complete package. Areas of opportunity would be in strengthening the velcro on the ankle closure, and adding an additional reflective stripe on the rear seam. There are cheaper options, but they definitely lack the panache of these overshoes. You’d be hard-pressed to do better. UPDATE: Rapha contacted me in less than 24 hours of this post offering to fix the stitching. Very nice! RATING: 85% – Almost a Consummate Pro if not for the two opportunities.